I had no idea what to expect as I criss-crossed the small town of Doué la Fontaine in search of the remarkable home of Bernard Roux. Doué la Fontaine is in the Pays de la Loire region of France, in the heart of troglodyte country, and I just happen to be a fan of all things troglodyte. So before setting off for Doué la Fontaine, I spent the better part of the day in the troglodyte village of Rochemenier, just ten minutes away. Now a museum which preserves twenty of the dwellings, Rochemenier was an village built underground by burrowing into the soft tufa stone of this region. Like all caves these dwellings had the advantage of constant temperature–warm(ish) in the winter, and cool in the summer. It was amazing how cozy these cave dwellings felt. When a family was expecting a new baby, a room would be added by tunneling deeper into the stone at the back of the house. No zoning or building permits required! In fact the troglodyte family sold the stone they quarried as they dug the next room, so they actually made money as they expanded their home! Passageways in Rochemenier connect one building to the next, so villagers didn’t need to venture outdoors on a nasty winter day. Several communal chambers served the whole village for their shared endeavors such as wine and cheese making and even a room where women gathered to chat as they did their textile work. The most remarkable structure in the village is the cave cathedral built in the 13th century and which stayed in use until the 1930’s. A little tough to photograph, but here’s an image of the vaulted ceiling–an underground spire, of sorts. My favorite postcard from Rochemenier is of this avant garde woman, one of the last generation Rochemenier troglodytes driving her locally made automobile. Now, onward to Bernard Roux’s. After several false turns, we spotted a little garage that looked different from the surrounding neighbors. Could this be Monsieur Roux’s home? I didn’t really think so as nothing else seemed out of the ordinary. Then stepping out of the car and venturing towards the garage I could see I was standing at the precipice of a cavernous space, filled with, well, filled with what? It wasn’t clear from this angle. We rang the doorbell at the side of the garage and waited. And waited. And waited. Sigh. No one home. We’d have to be content with this glimpse from on high. We took a few photos and started to walk back to the car when suddenly an elderly gentleman appeared at the gate. How did he get there??? “Bonjour, Monsieur. Nous cherchons Monsieur Roux. ” “C’est moi. Bienvenu.” And we followed him down the tiled steps into his wonderland. Built in the hollowed out cavity of an old quarry, Bernard Roux has injected a quirky twist to the eons-old troglodyte tradition. and part, well, a window onto Monsieur Roux’s rich imagination where dinosaurs are allowed to roam in the Garden of Eden. Monsieur Roux pointed out his homages to great French architecture: The Chateau de Chaumont and the Cathedral de Chenille. This wall of tools serves as a testament to Bernard Roux’s days as a laborer, in the trades of builder, butcher, baker, and mason. So happy we could meet this delightful gentleman who has taken troglodyte living to new heights. It was so hard to imagine that neighborhood kids used to consider Mary Nohl a scary witch. Here we were, arriving at her home unannounced. She threw open her door, greeted us with a huge smile and beckoned us in like old friends. Mary (age 86 at the time of our visit) told us the kids had been afraid of her because she was different. Her live-in aid, Vicky, who had once been one of those neighborhood kids confirmed this and admitted she too had thought Mary and her wildly decorated house were creepy. She had kept a wide berth. 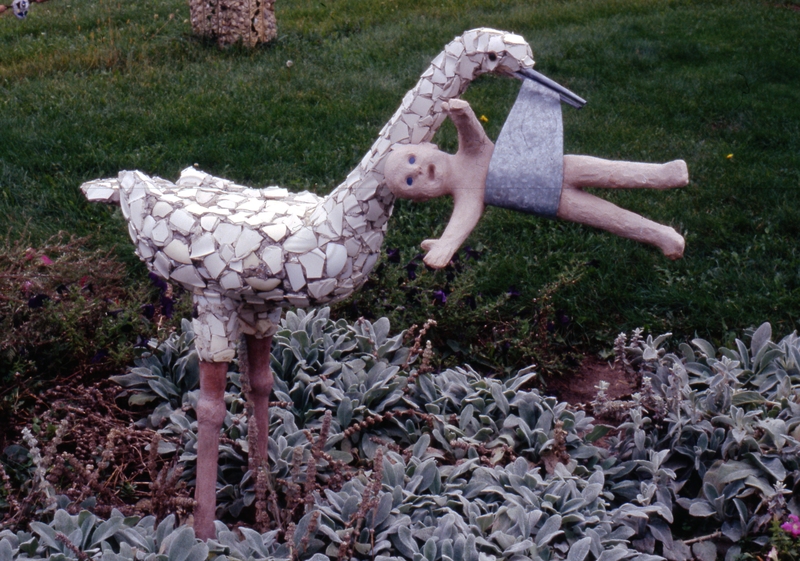 Others, though, had taunted Mary and repeatedly vandalized her yard art. Mary told us this with a sense of humor, but I’m sure the neighborhood disdain for her was painful. We didn’t know what to expect as we wound our way along the shore of Lake Michigan through her oh-so-ordinary suburban neighborhood in Fox Point, Wisconsin. Every lawn was manicured to a fare-thee-well. The whole neighborhood was so meticulous, and clean. No rusty cars, no junk on porches and not one whiff of creativity. We couldn’t imagine we’d gotten the address right. We couldn’t imagine Mary’s extravagant home environment could fit in here. Ah, well, that was just the point! Mary Nohl had never had one ounce of interest in fitting in. A simple suburban home utterly transformed. Mary’s lawyer father had introduced her to cement at the age of 12. Together they constructed the driveway gateposts. After her dad’s death Mary added heads on top of the posts. “My father would roll over in his grave if he saw what I’ve done”, she said, referring not just to the augmented driveway posts but to the lawn populated with Easter Island-esque figures. Of course the lawn couldn’t be mowed. Shouldn’t be mowed. Wouldn’t be mowed! And as anyone knows who is familiar with American suburbs, this is grounds for serious resentment. But this was of no concern to Mary. I had seen pictures ahead of time of the concrete lawn figures, but the inside of Mary’s house was such a surprise. Every bit of surface had been embellished. The blue and turquoise doors were covered with bas relief carvings and bolted with mechanisms which Mary had conceived of and executed with characteristic Yankee ingenuity. The walls, the floors, and even the carpets were sponged and splattered with red paint. From the ceiling of another room dangled row upon row of tractor feed paper edges which brushed against the forehead if you were as tall as Mary. . Remember how we used to feed accordion folded paper into our printers in the 1980’s? Remember how the edges of that paper were those pesky endless strips that you used to have to pluck off the edges of the page before you sent your document to its final destination, like your boss’s desk? Well everyone, EXCEPT Mary Nohl just threw those strips away. For her they were a free raw material, not to be wasted but to be put to good use. Mary’s sun porch was hung with ribbons. It seems she had never thrown out a ribbon in her 86 years of gift unwrapping. Mary who stayed a single woman her whole life (and who was quite content about that) had been encouraged by her father to attend college. Though Mary Nohl’s home environment is commonly considered “Outsider Art”, she in fact received an art school education at the Art Institute of Chicago in the 1920’s. Though unusually adept (for a woman in her era) at running and repairing power tools, Mary was encouraged to pursue a more traditional employment route than the work in industrial design that she had originally envisioned for herself. She tried a stint of teaching art in the Baltimore public schools but became discouraged by the limitations imposed on her and her students by the system. Mary decided to return home to Wisconsin, to be near family and friends where she set up a little ceramics business (again encouraged by her father). Mary led us down to her basement which was filled floor to ceiling with the remains of her production. Though delightful to my eye, they were not big sellers, and so Mary went on to other projects. Mary tried her hand at jewelry making, glass fusing, and painting. Around 1960, with the loss of her brother, followed by her father and soon after, the move of her mother into a nursing home, Mary was left to live alone for the first time in her childhood home. She now saw the world around her as her palette. She looked around her home and set to work making it truly her own. 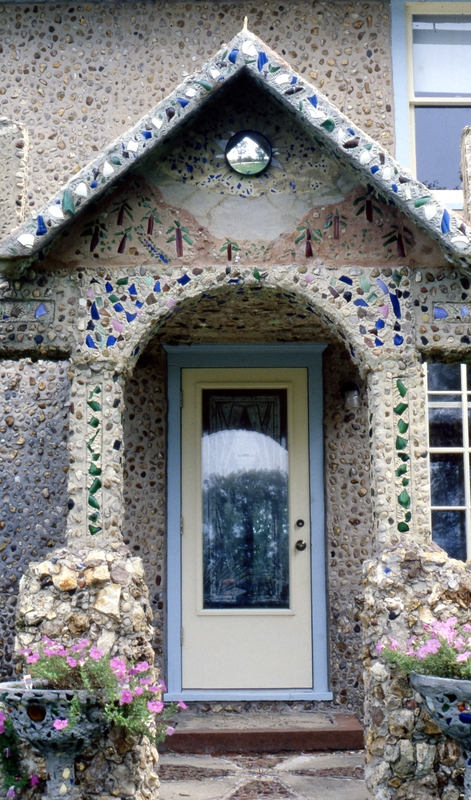 Happily, Mary gifted her property to Wisconsin’s Kohler Foundation which has built an internationally recognized reputation for championing and preserving outsider art environments. Mary Nohl’s home is currently being restored and will open to public at a future date. I cannot resist one wee little seasonal post. It’s that time of year when even the most ordinary of citizens reveal their inner wackiness. Folks who wouldn’t dream of building a permanent yard art environment for fear their neighbors would scoff , are suddenly liberated by the holiday season to let their creative juices flow. Several themes have emerged this season. First of all: Climate Change. I notice that the seal above is on a mighty tiny iceberg, with free flowing water on all sides. I have never seen the lawns this green in Massachusetts in December! This is a year that the only snowmen we’re seeing are plastic and styrofoam. I am freaked, they are freaked. And then we have the very American theme of Bigger is Better: (“I told you that chair was not for you!”). Who said Americans weren’t into royalty? We love royalty! Fun (?) fact I just heard on NPR on my drive home yesterday: Americans use more electricity on holiday decorations in one day than the entire country of Ethiopia uses for all its electrical needs on the same day. Feeling bad? Just use candles for your indoor lighting the rest of the year and we’ll be fine. Sorry–that was kind of a downer to end on–I actually love all this weird, ugly-beautiful stuff. The more the merrier! PS, you can have dots or your house AND your car without even stringing up any lights–with this latest gizmo–projected lights! No fuss no muss. The whole thing gets stored in a 12″ x 12″ x 10″ box. Now is that fair play? It’s safe to say that Forevertron (last post) will be around for a long, long while with its 300 tons of iron and steel–who on earth would want to dismantle that? 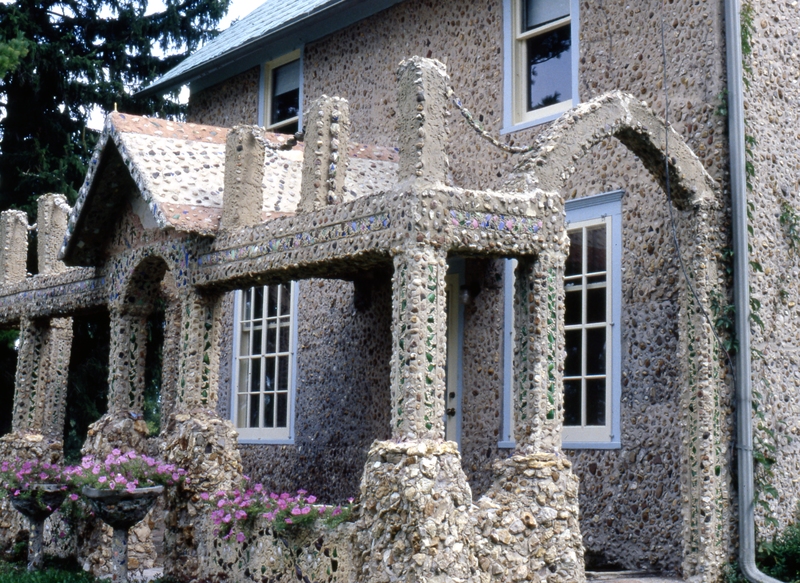 Likewise Fred Smith’s Concrete Park, the Dickeyville Grotto and the Wegner Grotto are not only built in concrete they all both protected sites (more on that later), now iconic parts of the Wisconsin landscape. But as is the case with many outsider art sites, two I visited were less securely bound to this earth and sadly no longer exist. tucked quietly away in Anton Flatoff‘s yard in the town of Steven’s Point, Wisconsin. Tony started this project in the 70’s with one fan he rescued from the trash heap from the hotel where he worked. Gradually, over the next decade or two he added more and more discarded fans, around 80 in all. When we arrived at his home we were greeted by his lovely wife, Elaine, and middle-aged daughter, who informed us that Tony was home, but very ill, and we would sadly not be able to meet him. They encouraged us to poke around the yard, assuring us that Tony loved admirers. “When you’re done with the Fan Fair, do come in”, Elaine urged us, and so we did. After showing off Tony’s indoor work (a flotilla of beer can ships and more planes), Elaine asked us shyly if we had any interest in HER hobby. YES! OF COURSE!, so she led us to the back of the house and flung open the door to a room jam-packed with dolls. Elaine explained that they were her “children”. By calling them her children, Elaine was clearly signifying that they were more than just a collection. Elaine had been one of 15 (!) children herself, and growing up she had always dreamed of having a doll. Her family was too poor to buy one for her. One day shortly after she and Tony were married elaine spotted a naked , dirty doll on the roadside which had been put out for the trash. She took it home, cleaned it up and sewed it an outfit. The next doll she bought at a yard sale with a spare quarter. And on it went. She showed us how she lovingly cared for them, , sewing clothing for each. And then, impishly, Elaine asked if we wanted to see her most special dolls, her “mixed up” dolls, she called them. You know we said yes! And up came the skirts of a few of the gals to reveal little male genitalia. “They came like that from the factory”, she marveled. Well, it made our day. I wonder, wonder, wonder what happened to all of Elaine’s dolls, and Tony’s oeuvre–all I see on the web when I look up Tony’s Fan Fair is “non-extant”. Sad! 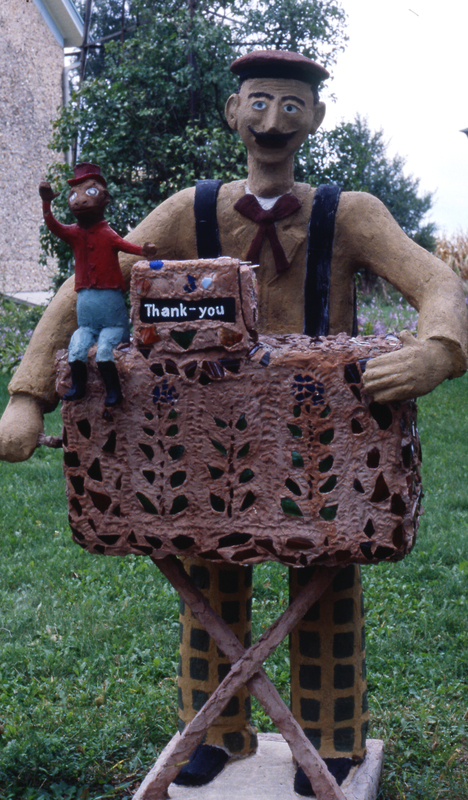 The raucous yard art which both delighted and disgruntled Paul Hefti‘s neighbors in La Crosse has also disappeared. His property, once a beautiful example of the very human impulse to create has been restored to a state of ordinariness. Sigh. 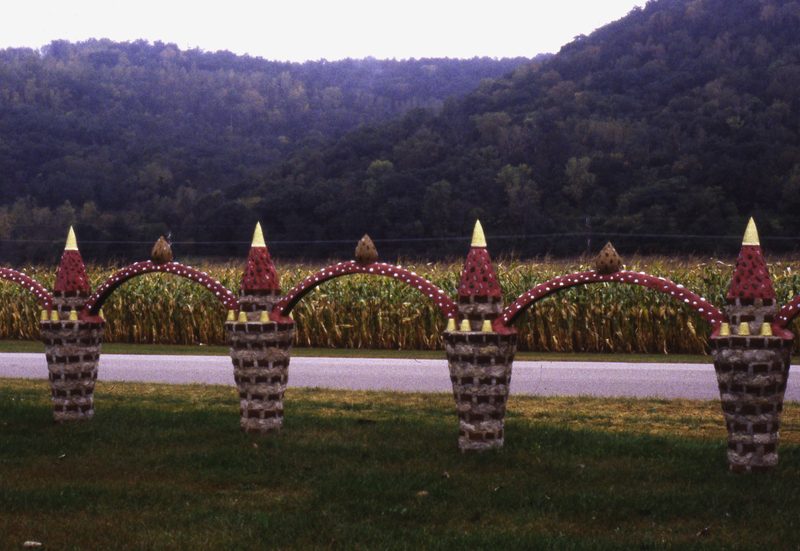 So I will treasure these images I have and share with you what got us to slam on our breaks as we were moseying through La Crosse on our way to visit Dobberstein Grotto (earlier post) in neighboring St Joseph. 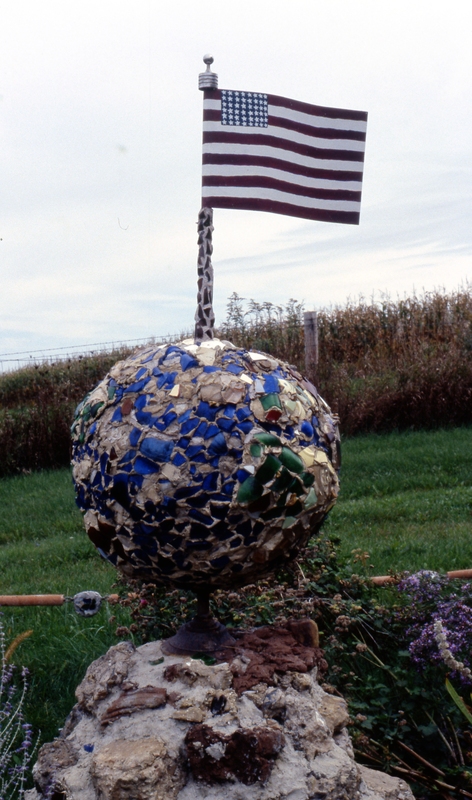 Strewn across an expansive yard long was Mr. Hefti’s impressive collection of reclaimed and reformatted detritus from our plastic, disposable world. I doubt there was any non-perishable trash that Mr. Hefti couldn’t have found a use for. Adieu, Paul Hefti, you funny, nice man! 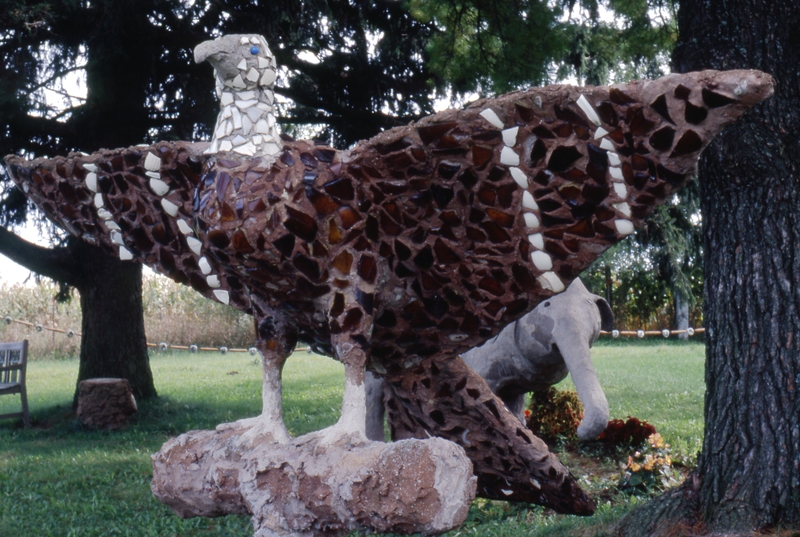 Just a few years after the Wegner couple (last post) began their mosaic-ed home environment, Nick Englebert began to transform his farmhouse and property in Hollandale, Wisconsin into a roadside environment. Like the Wegners he had made the trip to visit the nearby Dickeyville Grotto and it clearly lit the fire in his belly. He went home, stirred up some concrete and began coating his clapboard house. Into this soupy surface he pushed bits of glass, shells and stones. The effect is surprisingly light and lacy. For anyone else this would have been a life-long project, but not for Nick Engelbert, a man of many talents and boundless energy. 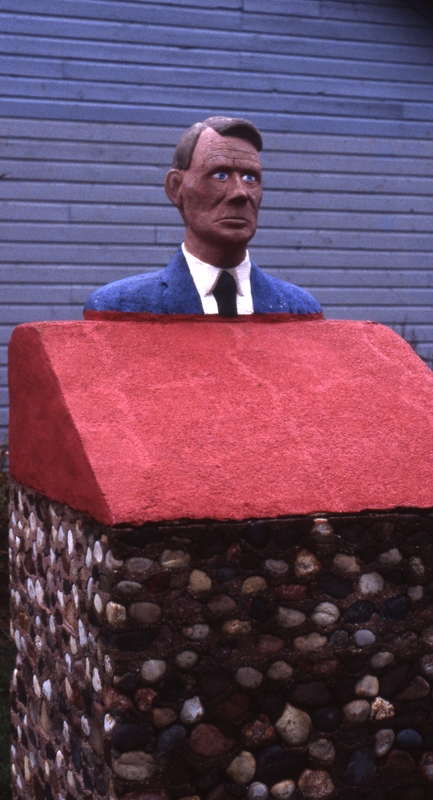 Prior to teaching himself to sculpt, Engelbert had been a machinist, a sailor, and engineer, a prospector and like any good Wisconsinite of the day, a farmer and cheese-maker . His house transformation was just the beginning of an astoundingly ambitious environment including figurative sculptures which cavort about his extensive property which Engelbert proudly called “Grandview“. Unlike the Wegners, Mr. Englebert did not adopt any of the religious bent of Father Wernerus’s Grotto. Instead, he paid homage to his European immigrant neighbors, which surely must have endeared his neighbors to him. And for his own “portrait” he sculpted first an Austro-Hungarian eagle and then an American eagle. Sprinkled about the environment are tell tale signs of Englebert’s love for his adopted homeland. 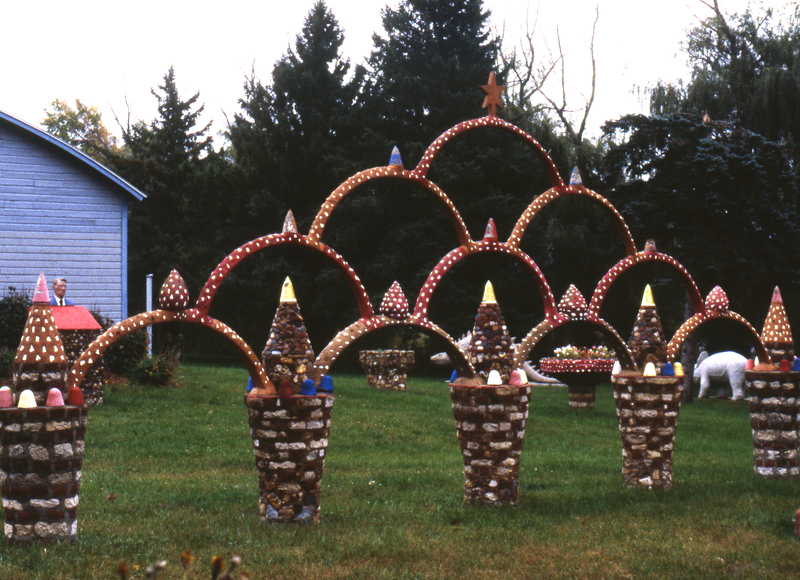 The oddly random subject matter of his sculptures and evident sense of humor made me wish that Nick Engelbert were still puttering about his yard when I made my visit. Sadly, Engelbert completed his last sculpture in 1950. 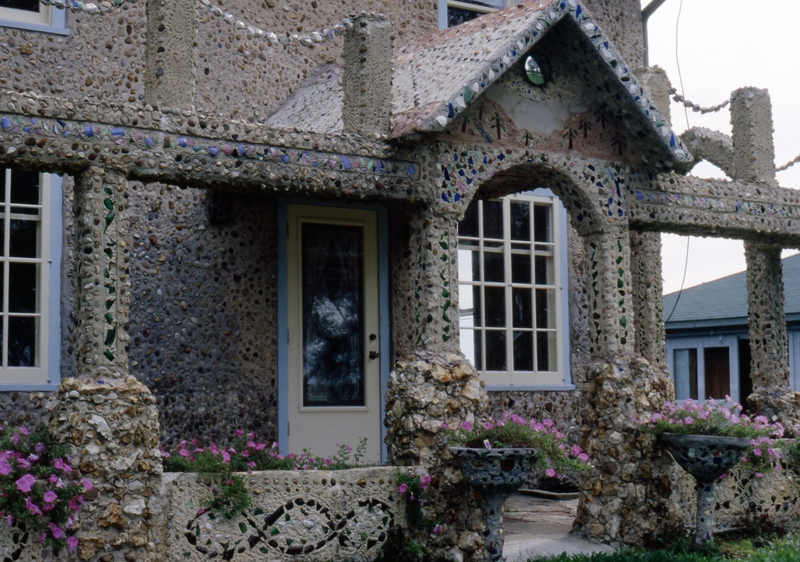 Born just five years after Nick Engelbert in 1885, Herman Rusch, too, was inspired by his visit to Father Wernerus’s Dickeyville grotto. 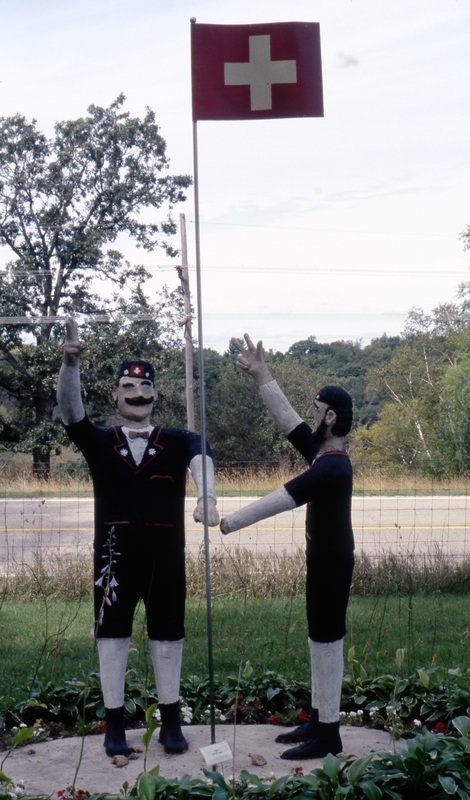 (I assure you, if you make the trek to Dickeyville, on your plane flight home you will start formulating a plan for a yard art project of your own.) 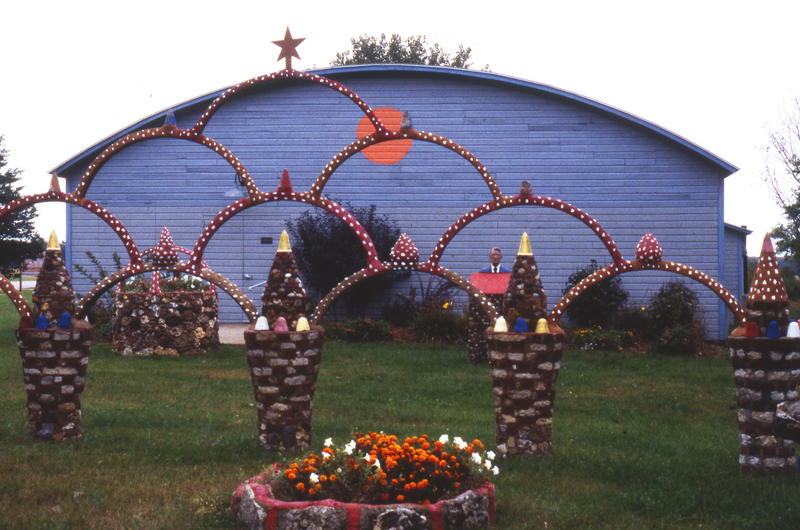 Besides the Dickeyville Grotto, Rusch had also visited and loved the roadside attraction in neighboring Iowa known as “Little Bit of Heaven” created by B.J. Palmer which is sadly no longer in existence. Both Palmer’s and Wernerus’s environments provided technical and aesthetic models for the do-it-yourself-er obsessive builder. Like most good Wisconsinites at the turn of the century, Herman Rusch had been a farmer, and though he worked diligently at that endeavor for 40 years, farming just did not satisfy his hungry soul. By the time he retired from farming in the 1950’s he was hankering for something new to sink his teeth into. He found the perfect project already waiting in the wings. His whole adult life, Rusch had been quietly and obsessively amassing a huge collection of Americana–tools, antiques, and oddities from the natural world. He was determined to create a museum of curios and found a dance hall near Cochrane, Wisconsin (I notice the village of Cochrane’s website does not make even one mention of Prairie Moon–hmmm) to transform into an exhibition space. an obelisk: and a dinosaur (why not? ).